The Mexican navy announced this morning that their search for Jennifer Ellis-Seitz, reported missing from Norwegian Pearl off the coast of Cancun on December 25, has ended. The US Coast Guard ended their active search on Saturday but continued to support Mexico's efforts with weather and current data. This morning Royal Caribbean announced Oasis of the Seas will enter service 11 days earlier than originally announced with two additional sailings. The first will be a 4-night cruise to Labadee departing Port Everglades on December 1, 2009. Then on December 5, it will depart on a 7-night eastern Caribbean itinerary to St. Thomass, St. Maarten and Nassau. The December 5 sailing will now be considered the "inaugural," and passengers booked on the December 12, which was originally announced as the inaugural sailing, will be offered the opportunity to switch to the December 5 sailing before it opens to public bookings on January 12. They will also have the option to book the December 1 sailing back-to-back with the December 5 cruise. NCL and STX Europe this morning announced they were modifying the F3 project to build only one of the 150,000-ton vessels. Delivery is now set for late May 2010. Disputes between NCL and the builder over the cost of modifications to the design requested by the line had been widely reported but unconfirmed by either party. They were said to be threatening the entire project, but both now acknowledge only that the project is now moving forward with only the one ship. MSC Cruises earlier eliminated their fuel surcharge on all sailings April 1, 2009 and after. This morning the line announced they will extend the policy to all 2009 sailings January 1 and after. Customers who have already made a booking for a 2009 sailing date will have the surcharge refunded in the form of an onboard credit. Additionally, the line said if fuel prices increase in the future, they may reimplement the charge, but guaranteed they will not add it to any booking under deposit at that time, markedly different than other lines warning they may reimplement the charge at some point in the future. The other lines are saying they reserve the right to add it to all existing bookings at that time. Royal Caribbean is opening two more offices in China to support their continued sourcing of customers from international markets. The offices will be in the central business districts of Beijing and Guangzhou and be the company's second and third in the country. (RCCL opened their Shanghai office in 2007.) The offices will support travel agencies selling the growing number of RCCL ships sailing in the region providing support for all three RCCL international brands. Traditionally a North American brand, in recent years the company has been placing an increasing importance on sourcing passengers from international markets, even dedicating ships to itineraries designed to appeal primarily regional market sources rather than a worldwide. Just this month the RCCL has created a new managing director position in Brazil and announced the opening of an office in Sydney. Holland America Line announced a Vacation Stimulus Plan today that includes a number of points to stimulate bookings. Points affecting consumers are some new promotional rates, reduced deposits (cut in half for cruises and Alaskan cruisetours departing May 1, 2009, and after), and a 25% discount on their standard Cancellation Protection Plan when purchased with a new booking for departure May 1, 2009, and after. There are some additional incentives included in the plan for travel agents. Crystal Cruises has announced they will eliminate their fuel surcharge on all 2009 cruises. The surcharge will no longer be placed on new bookings, and existing bookings under deposit will be adjusted to reflect the lower amount. Passengers who have made their final payment will have the fuel surcharge refunded through an onboard credit. Princess cruises is rewarding those who pay more with double credits in their Captain's Circle loyalty program enabling them to reach higher levels faster, beginning with cruises departing December 7, 2008, and after. Passengers who pay for and occupy a full suite (not a mini-suite), and passengers who pay a single occupancy fare will receive two credits rather than one. Passengers who do both, paying a single occupancy fare for a suite, will be rewarded with three credits. Princess offers multiple ways to reach the higher plateaus, and the new benefit multiplies only cruise credits, not cruise days. The three Royal Caribbean brands selling in North America announced this afternoon they too would suspend their fuel supplement on all 2009 sailings. Like the other lines, they are reserving the right to reinstate it if the price of West Texas Intermediate fuel exceeded $65 per barrel. We are finding some interesting twist to the lines' announcement about their "suspension" of the fuel supplement. Those will be discussed in today's edition of CND. The small (2,900-ton) expedition ship Ushuaia, ran aground yesterday in the Antarctic near the entrance to Wilhelmina Bay. The operator said the situation was stable and passengers were in no imminent danger. They reported that six other vessels were standing by. According to an Int'l Assn of Antarctic Tour Operators report, the passengers have now all been evacuated from the ship to the Chilean Naval Vessel Achiles and will fly the first leg of their journey home on Saturday. The crew remains aboard the ship. From aerial sightings, there appears to be no visible oil leakage, although the crew reports a minimal amount has seeped from a ruptured tank but has been quickly dispersed by the wind and currents. NCL announced this morning that Norwegian Sky's Miami deployment will continue at least through April 16, 2010. It will continue to operate the same 3 and 4-night Friday/Monday pattern to the Bahamas. Norwegian Cruise Line has followed the Carnival brands' lead and suspended the fuel supplement on all 2009 sailings. Those already having paid it will have it refunded in the form of an oboard credit. Bookings outside the final payment period will be adjusted to remove the fuel supplement amount. Carnival announced this afternoon that all of their North American brands will suspend charging fuel supplements effective with sailings December 17, 2008, and after. Passengers who have paid the supplement will have it refunded in the form of an onboard credit. Passengers who have not yet made their final payment will have their invoices adjusted. If the price of oil should again exceed $70 per barrel, Carnival said they reserve the right to reinstate the fuel supplement on current bookings. Evacuations by helicopter from cruise ships have become fairly common, but seeing them, especially from these unique vantage points, makes you realize what a delicate operation it is. While some of us may have seen this from the deck of a cruise ship, most of us would never have the opportunity to see the operation from these perspectives, if it were not for tiny video cameras. On November 29 (2008) the Coast Guard evacuated a 61-year-old man with a medical condition, and his wife, from Royal Caribbean's Explorer of the Seas while it was 130 miles east of Cape Hatteras, North Carolina. In this video provided by the Coast Guard, shot from a camera above the door of the helicopter, you can see the man and his wife being hoisted from the deck of the ship while the helicopter hovers 180 feet above the ocean. In the third of the sequence (in very raw footage), you see the whole operation shot from another aircraft a few hundred feet away. The Port of Seattle has signed a 10-year agreement with Carnival Corp to operate from the new cruise terminal at Pier 91 beginning next April. Under the agreement, the company will continue to bring at least 420,000 passengers to Seattle annually and base at least five ships there during each year of the agreement. 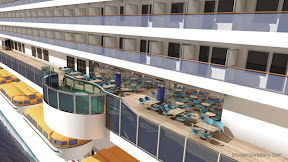 In return Princess and Holland America will get preferential use of the two berths at the new terminal. Question: Why Do Cruise Lines Still Send Ships through the Gulf of Aden? Over the last few weeks, much of the general news media has suddenly discovered the story of piracy of ships in the Gulf of Aden, a story which has been developing and covered by the trade press for several years. In their coverage, and especially with the recent encounter between Nautica and some pirates, they want to bring in the cruise ship angle. They are asking questions like what tools cruise ships have to defend themselves, or, with the rising number of ships being taken, why do cruise lines continue to send their ships through the Gulf. They have been asking the wrong questions, however. After covering cruise lines for a lot of years, we've come to know cruise lines aren't about to send their ships anywhere they believe there is a significant risk of harm to them and the people aboard. Therefore that means cruise lines are believing there is little risk associated with their passing through the Gulf of Aden. With that in mind, a few weeks ago we started to ask the question why they believe they are safe when the number of ships being taken is steadily increasing. Yesterday, CND had that important question answered during a wide_ranging discussion when we sat down for an exclusive interview with the top security officer of one of the cruise lines that had a ship sailing in the area recently. While most of the interview was on the record, we agreed to one big condition. We agreed not to reveal the person's name or the cruise line. He agreed to the interview because it is important for the public to know the cruise lines are not putting their ships or passengers at risk. He was speaking only for his own cruise line, but since all major lines share information on this matter, it's safe to assume the industry shares the same thinking. The reason we agreed not to identify the line is that we don't want the other side to construe what was being said as a challenge to them, a challenge to try to take a cruise ship, especially of this particular line. This person was simply answering our questions and explaining why the pirates aren't interested in taking a cruise ship. Yes, that's right. At this point in time, pirates really aren't interested in cruise ships. Something that doesn't come across in most of the general news media reports is the pirates in this area are not just a bunch of rogues with boats roaming around out at sea trying to stop any ship they come across. The pirates off the Somali coast are part of larger operations run from ashore by smart business people. They are only interested in making money. They capture a ship, hold it for ransom, get paid and let it go. The people in charge follow what ships are coming toward the area, decide what would be the easiest (and presumably profitable) to take, and then send the guys in the boats out to get the ship. Cruise ships don't really fit into that business model. They are quite different from cargo vessels, and wouldn't be nearly as easy of a target. The pirates are looking for the easiest targets, and even within commercial vessels, he said different types of vessels have different rates of being targeted. Cruise ships are actually quite different from the cargo vessels the pirates have been taking, and would be perhaps the hardest to take. First of all cruise ships generally move much faster than the pirates' small boats. And you should believe when they pass through that area, they are moving fast. Just like when you drive through the bad part of town, you want to be through it as quickly as possible, so you increase your speed and don't stop. Cruise ships are also built differently than most of the cargo vessels and tankers, and therefore, if the pirates can get alongside, they are not nearly as easy to board. Staffing is another difference. Cargo vessels generally don't have the numbers of people cruise ships do to watch in all directions around the clock, so a cruise ship will probably have more warning of a potential attack by pirates than a cargo vessel. Along those same lines, cruise ships carry a much larger security force to defend the vessel should there be an attempt to board. It probably will far outnumber the pirates. Of course, something we did not talk about in any detail is that cruise ships generally have a better arsenal of ways at their disposal to defend themselves than most cargo vessels will. So with all these things making it more difficult to take a cruise ship, why would the pirates want to go to all the extra trouble to take a cruise ship? It's vastly easier to take a cargo vessel, especially some types. But there's more. If the pirates did somehow manage to capture a cruise ship, then what? They would face much bigger challenges holding a vessel with several thousand people aboard than they do holding a cargo vessel with a couple dozen people. Again, these pirate groups are smart business people, who have thought this all out. There wouldn't be an overnight solution to the hijacking. The captors don't call the CEO of the company that owns the vessel, agree on a price and funds are wired to the pirates. Instead to protect themselves, the pirates work through several layers of intermediaries, and the process would take several weeks, at best, to be resolved and have the ship released. During that time the pirates would have to provide food probably for a couple thousand people, a large amount of fuel to keep powering the ship even minimally, and it would be almost impossible to keep control of that many people. "It's a very different equation to take on a ship with that number of people than it is to take on a ship with 25 people," he said. The law of averages says among the passengers there would be ex_military people, off_duty law enforcement officers and people who just wouldn't stand for being held captive. It would also be impossible for the captors to know all the faces, so they would be vulnerable to rescue forces slipping aboard and being among the people waiting for the right time to neutralize the pirates. It would be an almost impossible situation for the pirates to deal with. Again, there are smart business people behind these operations. They have thought this out, and why would they want to change a successful business model which is working so well for them and add all this extra risk and expense to their operation? There are about 60 cargo vessels per day passing through the area; all of them would offer easier opportunities for success and profit than a cruise ship. What about the two instances where cruise ships have been attacked, including Sunday's incident with Nautica? He said he has seen no information about either that would lead him to believe that there was any serious attempt to board either ship. He said those may have simply been targets of opportunity, where the guys in the boats were sent out to get a particular ship and didn't see it or failed to get it. The cruise ships then came by and the guys on their own decided that since they were there, they may as well try to see how far they could get with the ship. ("Just messing with them," as he put it.) We'll never know, but they didn't get very far into either attempt before they called them off. Another surprise in cruise lines' thinking came when I asked about risk levels increasing. About a dozen cruise ships a year move through the Gulf a couple times a year each either as they reposition between seasonal deployments or as part of an already_lengthy cruise, such as a world cruise. It would certainly have a big impact on the company if he decided for some reason the risk was too great for the ship to go through the area. What types of things, I asked, could cause the risk to increase enough that it wouldn't be safe for a ship to transit the area? I was surprised when he said that for almost any increased risk he could think of, there was something he could do to lessen it or counterbalance it. Some of them, of course would be expensive, but they would lessen the risk to a point where the ship could pass though the area safely. In closing the interview, he said that he feels that it is safe for his line's ships to transit the Gulf. There is a tremendous amount of thought and planning put into how every one of the line's vessels transits the Gulf, and he would be completely comfortable with his grandmother or daughter sailing on them. That says a lot. I came away from that discussion having a much better understanding of why the cruise ships keep going through the Gulf of Aden, and I feel our readers now should too. Orginally published in Cruise News Daily December 2, 2008 edition. Copyright CND, all rights reserved. This may not be legally posted elsewhere. While transiting the Gulf of Aden this morning at 9:28am local time (12:28am Eastern Standard Time), the bridge officer on duty aboard Oceania's Nautica noticed two small boats approaching rapidly, approximately 1000 meters away, and deemed them hostile. The captain took evasive action and eventually outran them. During the encounter, one of the boats did manage to close within about 300 meters and did fire eight rifle shots toward Nautica, but there were no injuries aboard the cruise ship. Nautica was within the Maritime Safety Protection Area at the time of the incident, and it lasted only a few minutes. All of the prescribed international authorities were immediately notified, and Nautica is now proceeding to its next scheduled port, Salalah (Oman) where it is expected to arrive on Monday. MSC announced that their fuel supplement will be eliminated on sailings (booked in North America) April 1, 2009 and after. All currently booked passengers will have their accounts adjusted downward to remove the surcharge. Passengers sailing from January 1 through March 31, 2009 will have the surcharge refunded in the form of an onboard credit should the price of West Texas Intermediate fuel close at or below $65 per barrel on the New York Mercantile Exchange on December 18, 2008. If you live in South Florida, you might want to get up early on Monday (November 3) to see something you’ve never seen before. Celebrity Solstice will be arriving at Ft. Lauderdale for the first time. The ship is the first of the Solstice Class, and it’s the first time it has ever called at a US port. The ship is expected to arrive at the Port Everglades sea buoy at approximately 6am, and will be dockside by approximately 7am. Celebrity says that ideal viewing platforms include Fort Lauderdale Beach and surroundings. The ship will be coming and going a lot over the next three weeks during its inaugural activities. Those include the naming ceremony on November 14. Celebrity Solstice will officially enter service on November 23. Norwegian Cruise Ling became the latest line to announce it would eliminate the fuel supplement for new bookings for 2010 and beyond as well as establishing guidelines for removing it from 2009 sailings. The NCL announcement seems modeled most closely after Royal Caribbean's. The line said that effective November 10, 2008, the fuel supplement will no longer be applied to bookings for 2010 sailings and beyond. Like RCCL, NCL said they would be removed from existing bookings for 2009 and 2010 if "the closing price on the NYMEX (New York Mercantile Exchange) of West Texas Intermediate fuel [is] below $65 per barrel two weeks prior to the beginning of the calendar quarter (dates specified below), the company will refund fuel supplements paid in the form of an on-board credit." The closing price on that date will determine eligibility for the refund for the entire quarter. Details were in the October 30, 2008 edition of Cruise News Daily. It seems that lately there have been several articles published by various media outlets that are either basically untrue or the headline and lead seem designed to seriously mislead the reader. The Mirror published an article that says a crew member aboard Queen Mary 2 murdered his girlfriend who was also his supervisor while the ship was in dry dock in Hamburg. It even goes on to say an autopsy will be held. The problem here is that the story is almost completely false. The altercation basically came down to a scuffle, according to Cunard. The man was taken into custody by police who took him in for questioning and later released him. The woman is still quite alive. The Telegraph carried an article yesterday headlined, "Cruise passengers tossed into sea in high winds off northern Spain." That calls up visions of passengers on deck being blown off the deck into the ocean while the ship is at sea. Not exactly. The passengers were boarding the ship while strong winds were moving it, and the gangway which they were using fell into the water. While it's certainly a serious situation, it's not really the one the headline leads you to believe "off northern Spain." It happened right in port on the Spanish mainland. And then there was the article entitled "Holidaymakers stranded in Liverpool dock after cruise is cancelled," which ran in the Mail, as well as similarly titled articles in other newspapers. That evokes images of passengers being in a strange city on their own with no way to leave or get home. Not exactly. It seems their short cruise, which embarked at Liverpool, was canceled due to bad weather just off shore. Instead of sailing the cruise line operated everything aboard the ship just as if they were at sea. Since it was a weather-related reason for the cancellation, the line was unwilling to provide a cash refund but did offer credits toward a future cruise. They even provided local sightseeing. Granted, there is a story in the customer service aspect, the passengers were hardly "stranded" as the title says. Carnival Corp announced this afternoon that they will close their Ocean Village brand in the fall of 2009 and transfer the first ship to the P&O Australia brand in time for the 2009 Christmas season in Australia. The second will tranfer a year later. The line said that it makes sense from a profit standpoint since the Australian market shows tremendous growth and profit potential. They feel that UK passengers who would have booked the Ocean Village brand can be absorbed into the growing P&O and Princess brands. Instead the ship will sail from San Diego on a new program of 4- to 12-night itineraries to Mexico. Details and analysis of the ship appeared in the October 29, 2008 edition of Cruise News Daily. Carnival Cruise Lines announced they have canceled Carnival Liberty's northern Europe program for 2009 and will instead deploy the ship in the Caribbean. At the same time, through other adjustments, the line will also launch Carnival Pride's Caribbean program from Baltimore on April 27, 2009 rather than their original September launch. Details and analysis appeared in the October 28, 2008 edition of Cruise News Daily. Fincantieri laid the keel today for P&O's next ship, a sister to Ventura. P&O took the occasion to announce that they have chosen the name Azura for the vessel. Delivery is set for the spring of 2010. Royal Caribbean has set an end to the fuel supplement for 2010 sailings, and the criteria for eliminating it on 2009 and previously booked 2010 sailings. The announcement applies to worldwide sales of three of their brands: Royal Caribbean International, Celebrity Cruises and Azamara Cruises. For bookings made November 10, 2008 and after, the brands will no longer charge a supplement for sailings that depart January 1, 2010 and after. For 2009 sailings and passengers who have already booked 2010 sailings with a supplement, the company will determine on a quarterly basis if fuel supplements will be refunded. Refunds will be authorized "if the closing price of West Texas Intermediate fuel is $65 or less, at the closing time of the New York Mercantile Exchange, two weeks prior to the beginning of the upcoming calendar quarter." If that condition is met, refunds will be made in the form of an onboard credit. The company made specific note that should fuel prices again begin to rise, they may reinstate a fuel supplement on new bookings. Details appeared in the Ocotber 24, 2008 edition of Cruise News Daily. Meyer Werft delivered Celebrity Solstice to Celebrity Cruises this morning (October 24). The ship will sail from Eemshaven on October 25, and anticipates arriving at Port Everglades on November 3. Once at Ft. Lauderdale, Celebrity has scheduled a series of inaugural functions for the first-of-its-class vessel. It will be named at Port Everglades on November 14. Celebrity Solstice will enter service on November 23 with a series of 7-night eastern Caribbean cruises. Carnival will launch a new advertising campaign in November, the first product of Arnold Worldwide, their new advertising agency. The new ads will be "fun," of course. One feature will be "Towel Animal Theatre." All will have the new tagline: Fun for all. All for fun. The trade and consumer magazine advertising will launch beginning November 10. Four consumer ads will run in People magazine November 17 through December 8. Two new TV spots will also begin running at an unspecified date in November. Those will be directed by Noam Murro who has directed award-winning ads for Volkswagen, Hummer, "Monsters" and Nike. He also directed the recent movie, "Smart People." Details and perspective appeared in the October 23 (2008) edition of Cruise News Daily. Ruby Princess was delivered to Princess Cruises today (October 23) and has set sail for Port Everglades where it is expected to arrive on November 4. The ship, a sister to Crown and Emerald Princess, will enter service on November 8 with a winter series of 7-day western Caribbean cruises. The complete article appeared in the October 23, 2008, edition of Cruise News Daily. Carnival Cruise Lines will resume operation from Galveston on November 1, after operating temporarily from Houston due to damage at Galveston caused by Hurricane Ike. Carnival Ecstasy's November 1, 2008 sailing will be the first cruise ship to return. It will be followed on the next day (November 2) by Carnival Conquest. Details appeared in the October 22, 2008 edition of Cruise News Daily. The Mobile Press-Register reports that while a couple was getting married on Saturday, someone came into the church and stole the bride's purse and money from the purses of all the bridesmaids. It sounds like the bride could also potentially be in for identity theft because in her purse was her checkbook, driver's license and passport. She says she can deal with all that, but what her biggest problem is at the moment is not having her passport. The couple was to leave for their honeymoon on a cruise on Monday, and without the passport, she is afraid she won't be able to board the ship. The couple went ahead and left for Tampa anyway hoping something will work out. These days, it seems you can lose more than they actually steal. MSC announced another winner of a free Caribbean cruise in their ongoing promotion to draw attention to MSC Orchestra's upcoming arrival in the US. The 92,400-ton MSC Orchestra is the largest MSC has ever had in the Caribbean, and it will arrive at Ft. Lauderdale on January 2, for a winter season of 7-night Caribbean sailings. UK customs officers seized more than 65 pounds of cocaine when P&O's Arcadia docked at Southampton on Sunday. They arrested seven people involved; all were passengers aboard the ship, which was returning from a 23-night Caribbean cruise, and all listed addresses in the UK. Officials estimate the drugs were valued at almost $2.1 million. Hurricane Omar has moved out to sea and is no longer a threat to cruise ships. Carnival Glory - departed Port Canaveral Saturday (October 11) - Grand Turk (on Thursday, October 16 - 8am-5pm) is being substituted for the St. Maarten call (on Wednesday) which was canceled. The new itinerary calls at Nassau (Sunday, October 12), St. Thomas (Tuesday, October 14) and Grand Turk (Thursday, October 16). Carnival Triumph - departed Miami on Sunday (October 12). The itinerary has changed from an eastern Caribbean itinerary to a western Caribbean itinerary. The new itinerary calls at Half Moon Cay (Monday, October 13), Ocho Rios (Wednesday, October 15 - 7:30am-3:30pm), Grand Cayman (Thursday, October 16 - 7:30am-3:30pm) and Cozumel (Friday, October 17 - 10am-6pm). Crown Princess - departed Ft. Lauderdale on Sunday (October 12). Ports have been rearranged and substituted to remain out of the storm's way. The eastern Caribbean itinerary originally called for ship to go to St. Maarten on Wednesday, St. Thomas on Thursday, and Grand Turk on Friday. It will now call at Grand Turk on Wednesday (October 15 - 7am-1pm), Ocho Rios on Thursday (October 16 - 9am-5pm) and Grand Cayman on Friday (October 17 - 7am-6pm). Royal Caribbean's Mariner of the Seas - departed Port Canaveral on Sunday (October 12). The eastern Caribbean itinerary has been changed to a western Caribbean program. The calls at St. Thomas and St. Maarten have been canceled. Instead the ship will remain at sea on Wednesday (October 15) and visit Grand Cayman on Thursday (October 16) and Cozumel on Friday (October 17). It doesn't even have a name, but Carnival Legend moved out of its way. Tropical Depression 16 was moving through the Bay of Honduras yesterday and moved on shore today and dissipated so that it no longer even has tropical depression status. Carnival Legend (which departed Tampa last Sunday, October 12) was to have sailed from its call at Cozumel on Wednesday evening to Thursday's scheduled call at Belize. Since it would have had to move close to the storm, the Belize call was canceled, and Carnival Legend remained in Cozumel overnight and will leave there at 4pm on Thursday headed to its scheduled call at Roatan on Friday. The ship will then be back on schedule and will return to Tampa as scheduled on Sunday (October 19). Effective immediately Ian Bailey has assumed the position of VP of Investor Relations for Royal Caribbean Cruises Ltd. Bailey joined the company in 2000 and has been the VP of Corporate and Capital Planning for the past year and a half. He replaces Greg Johnson, who previously served as AVP, Investor Relations and has assumed a new role within the company’s Corporate and Strategic Planning department. Carnival will add 98 balconies to Carnival Sensation during previously-scheduled drydock in January. At the same time, a number of the suites, which currently have balconies, will have their balconies enlarged and extended. Carnival says the balconies are and addition to the Evolutions of Fun enhancements being added to the line's Fantasy-class ships. The Evolutions of Fun additions already include an updated pool area, a waterpark, and an adults-only deck area. Royal Caribbean International will base Brilliance of the Seas at Dubai for a program that will run from January to April 2010. Itineraries and program details will be announced later. Hurricane Norbert has moved out of the ocean and is no longer affecting cruise ships. The itinerary changes that have occurred are shown below. Carnival Elation - departed San Diego Thursday (October 9) - The Cabo San Lucas call on Saturday will be canceled. The revised itinerary calls at Catalina on Saturday (October 11 - 8am-5pm) and Ensenada on Sunday (October 12 - 8am-5pm). Carnival Elation will return to San Diego on Monday (October 13) as scheduled. Carnival Pride - departed Long Beach Sunday, October 5 - The Mazatlan call on Thursday (October 9) will be canceled and replaced with Cabo San Lucas on Thursday (October 9 - noon-6pm) as the ship hurries to pass in front of Norbert's path. A call will then be added at Ensenada on Saturday (October 11 - 8am-5pm). Carnival Pride will return to Long Beach as scheduled on Sunday (October 12). NCL's Norwegian Sun - departed San Francisco Thursday (October 2) - The ship will cancel its call at Cabo San Lucas on Friday (October 10) and remain at sea. Norwegian Sun will return to San Francisco as scheduled on Monday (October 13). Holland America's Ryndam - departed San Diego Sunday (October 5) - The ship is on a charter and not operating its regular itinerary. A call at La Paz on Friday (October 10) has been canceled, and the ship will remain at sea, creating three sea days in a row. Sapphire Princess - departed Los Angeles Saturday (October 4) - The only change was a cancellation of a call at Cabo San Lucas Thursday (October 9) as the ship wants to cross the storm's projected path ahead of it instead of having to wait for the storm to pass. The ship is therefore spending the day at sea. Sapphire is expected to return to Los Angeles on Saturday as scheduled. This item will no longer be updated. This afternoon Carnival Corp made two announcements regarding their US brands' fuel supplements. The first deals with 2010 sailings. Effective on October 31, they will eliminate the supplement while simultaneously increasing prices, effectively rolling the price of fuel into the fare. In the second part of the announcement, they set guidelines for removing it from 2008 and 2009 sailings. For that to happen, the company said, the price of oil would have to be $70 per barrel or less at the 2:30pm close of business (as reported by Reuters) for 25 consecutive trading days. At that point the brands would removed the surcharge on sailings at least five trading days in the future. Cunard's Queen Elizabeth 2 left Southampton this afternoon on its final westbound transatlantic voyage. It is scheduled to arrive in New York on Thursday (October 16, 2008). That will be its final visit to the Big Apple. As we reported earlier in Cruise News Daily, the day will be marked by many toasts and events, but the grandest will be when QE2 leaves New York at 5pm for the final time for her final voyage across the Atlantic. The round trip from Southampton to New York and back will be in tandem with the larger Queen Mary 2. If you'd like to witness the tandem departure from New York, accompanied by FDNY fireboats, Cunard suggests the following vantage points: Battery Park (on the southern shoreline of Manhattan), Robert F. Wagner Jr. Park (overlooking the Hudson River with great views of the Statue of Liberty), the Esplanade (running the entire length of Battery Park City, along the Hudson River from Stuyvesant High School on the north end all the way south to Battery Park, and Hudson River Park (extends for five miles along the Manhattan shoreline from Battery Place to West 59th Street). QE2, the longest-serving vessel Cunard has ever had, will be retired in Dubai on November 27, 2008. Carnival Destiny became the first cruise ship to visit Carnival Corp's Grand Turk Cruise Center today (October 8, 2008) after much of the island was damaged by Hurricane Ike on September 6 & 7 (2008). The cruise center has been fully repaired, but much of the rest of the island is still rebuilding. The island has recovered beyond just meeting basic human needs and has now moved into a phase where it is working toward economic recovery. Carnival Destiny's arrival plays a big role in that since the cruise center and companies linked directly to it are the largest private employer on the island. Other ships previously scheduled to call at the island will now begin calling as scheduled. The first will be Crown Princess on October 10. Details are in the October 8 edition of Cruise News Daily. Carnival Corp confirmed today that their Puerta Maya pier and cruise center on the island of Cozumel will reopen on October 16, 2008. Along with the new two-berth pier, the adjacent nine-acre cruise center with a variety of shops and restaurants, will open. The new facilities also include a four-acre transportation hub for taxis, excursion buses and rental cars, and a new excursion pier for water-based excursions so they can leave directly from the facility. In addition to calling at Puerta Maya, vessels from all Carnival brands will continue to also use the other two piers at Cozumel. Puerta Maya is located on the southwest part of Cozumel about five miles south of San Miguel, the island's largest city. Puerta Maya has been closed since it was destroyed by Hurricane Wilma, which caused massive destruction on the island in 2005. Details appeared in the October 7, 2008 edition of Cruise News Daily. When the long-time gambling ship Sea Escape shut down August 10, they said they would shortly announce another port where they would set up operations. The company said they couldn't compete with all the gambling opportunites in South Florida. They never got the chance to see if they could make the gambling ship work somewhere else. As they were preparing to move to ship, officially Island Adventure, to the Bahamas while they worked out their plan, it was arrested by US marshals in response to a lawsuit filed by crew members who hadn't been paid. The judge gave the owners until September 26, 2008 to raise the money for the crew members, and other creditors which later piled on. (In total $2.3 million was said to be owed.) In addition to raising the money in the usual ways, the judge also allowed the owners to contract to sell or charter Island Adventure. They couldn't find anyone interested, and today the judge ordered the ship sold at auction on October 16. And that seems to be the end of Sea Escape - a South Florida tradition. Royal Caribbean will sell their interest in Island Cruises to their partner in the venture, First Choice Holidays. One of the two ships, Island Star, which Island charters from RCCL will be returned to RCCL in April 2009 and redeployed to RCCL's Pullmantur brand. From later statements by TUI, First Choice's parent, the Island Cruises brand apparently will next year be folded into Thomson Cruises, another of TUI's holdings. The complete story appeared in the October 6 (2008) edition of Cruise News Daily. Disney Cruise Line will send Disney Magic to Europe from April thru September 2010. The program will include 10- and 11-night itineraries in the Mediterranean, similar to what the line operated previously in 2007. This time, however, Disney Magic will also offer 12-night cruises in the Baltic. Additionally, Disney Wonder will shift to 4- and 5-night cruises out of Port Canaveral during the summer of 2010. The complete story was carried in today's edition of Cruise News Daily. Carnival Cruise Lines has formed a new department that will focus on developing new onboard experiences and improving on the existing programming. 17-year Carnival veteran Chris Arnholt will head up the new initiative. She will have the new title VP of guest experience and business development. As previously reported, due to the damage sustained during Hurricane Ike, the Grand Turk Cruise Center will not be operational until October 8. The initial plan was to alter schedules on a week-by-week basis, but Carnival has settled on an ongoing schedule. Carnival Miracle - sailing from New York on September 22, September 30 and October 8. Carnival will replace Grand Turk with Tortola. Note: Even though Grand Turk will be open on October 8, Carnival chose to replace Grand Turk on the October 8 sailing, but says they do not expect to repeat the substitution on any subsequent sailings. Carnival Liberty - sailing on September 20. Carnival could not find an available alternate for Grand Turk, so the port call in San Juan will be extended to 6pm and the following day (which was scheduled for Grand Turk) will be spent at sea. Carnival Miracle - sailing from New York on September 14 - Replacing Grand Turk with Tortola: The new itinerary calls at San Juan (Wednesday, September 17), St. Thomas (Thursday, September 18) and Tortola (Friday, September 19). Miracle will return to New York on September 22. Carnival Triumph - sailing from Miami on September 14 - Replacing Grand Turk with Nassau: The new itinerary calls at Half Moon Cay (Monday, September 15), St. Thomas (Wednesday, September 17), San Juan (Thursday, September 18), Nassau (Saturday, September 20). Triumph will return to Miami on September 21. Updates will be added to this item as they are received from Carnival. Last week, Carnival Ecstasy left Galveston as Hurricane Ike was headed toward the port. The storm caused both a change of itinerary, to stay away from it, and delayed the return, first while the storm passed and then because the port was closed due to damage. While Carnival worked to find an alternate port for the ship, it went to New Orleans and disembarked passengers who wanted to fly home, and others stayed aboard the ship and ended the odyssey yesterday when the ship arrived in Houston. Aboard the cruise was a group of 30 from the Wichita Falls Board of Commerce and Industry. (The group does different outings and is called "Just for Fun.") With the hurricane coming only four decided to cancel. The group has now all returned home, and Tuesday the local news media began carrying the first interviews. It's interesting how they have entirely divergent perspectives. Two articles interview different people from the group, but they have entirely different outlooks. The first was in the local newspaper, the Times Record News. The person interviewed for that one seems to have a very balanced view that understands the situation and is accepting it in a very matter-of-fact manner. The second story is from the Texomas website (an outlet from a combination of three Wichita Falls TV stations) and quotes a gentleman, part of the same group, who enjoyed the company, but isn't at all happy with the way things were handled by Carnival. For the record, contrary to what the second article says, it is safer to take the ship out when a hurricane is approaching since it doesn't sail through the hurricane, but rather stays far away from the strongest winds. Carnival was offering full refunds to passengers who asked for them, on the day of sailing, once the storm's path toward Galveston became clear. Hurricane Ike has moved inland and is longer causing additional changes to cruise line itineraries. The Port of Galveston closed to inbound vessels at 11am LT on Thursday (September 11) and to outbound vessels at 11pm LT on Thursday. They have not yet set a time to reopen. Updated September 14 - 6pm: Carnival has canceled the next sailings of Carnival Conquest and Carnival Ecstasy tentatively scheduled for Monday (September 15). Both ships are now sailing to New Orleans. See the individual sailings below for details. Updated September 14 - 6pm: Carnival Conquest departed Galveston Sunday (September 7): The call at Cozumel was lengthened to two days since Conquest cannot return to Galveston as scheduled. The revised itinerary calls at Montego Bay on Wednesday (September 10), Grand Cayman on Thursday (September 11) and Cozumel on Friday & Saturday (9am September 12 - 4pm September 13). Sunday (September 14) will be spent at sea. Conquest will now dock at New Orleans on Monday (September 15), and passengers may disembark on Monday or Tuesday. Passengers may also remain aboard and return to Galveston with the ship when the port reopens, but as yet, there is no estimate when that will be. Updated September 14: Carnival Conquest originally scheduled to depart Galveston Sunday (September 14): Carnival has canceled this sailing since Galveston is closed and no suitable nearby pier facilities are available. Updated September 14 - 6pm: Carnival Ecstasy - departed Galveston on Thursday (September 11): The call at Cozumel has been replaced with one at Veracruz. The new itinerary calls at sea on Friday, call at Veracruz on Saturday (September 13 - 8am-6pm) and be at sea on Sunday. Ecstasy will now dock at New Orleans on Tuesday (September 16 - 2pm), and passengers may disembark on Tuesday or Wednesday. Passengers may also remain aboard and return to Galveston with the ship when the port reopens, but as yet, there is no estimate when that will be. Updated September 14: Carnival Ecstasy scheduled to depart Monday (September 15): Carnival has canceled this sailing since Galveston is closed and no suitable nearby pier facilities are available. Carnival Fascination - departed Miami on Monday (September 8): Changed from western Caribbean to Bahamas. The new itinerary calls at Nassau on Wednesday (September 10 - 8am-5pm) and Freeport on Thursday (September 11 - 8am-5pm). Fascination will return to Miami as scheduled on Friday (September 12). Carnival Imagination - departed Miami on Monday (September 8): Substituted a call at Freeport for Grand Turk. Sea conditions also have forced cancellation of the call at Half Moon Cay. The revised itinerary now calls at Freeport on Wednesday (September 10 - 8am-5pm), Nassau on Thursday and Friday (September 11 & 12 - 8am on Thursday-2pm on Friday). Imagination will return to Miami as scheduled on Saturday (September 13). Carnival Inspiration - departed Tampa on Monday (September 8): The revised itinerary calls at Progreso on Wednesday (September 10 - 8am-4pm) and Cozumel on Thursday (September 11 - 10am-8pm). Inspiration will return to Tampa as scheduled on Saturday (September 13). Carnival Legend - departed Tampa on Sunday (September 7): Canceled call at Grand Cayman and will remain at sea that day. The revised itinerary now calls at Cozumel on Wednesday (September 10), Belize on Thursday (September 11) and Roatan on Friday (September 12). Legend will return to Tampa as scheduled on Sunday (September 14). Carnival Liberty - departed Miami Saturday (September 6): Instead of an eastern Caribbean itinerary, Carnival sent the ship to the western Caribbean, cancelling the calls at Half Moon Cay, St. Thomas, San Juan and Grand Turk. Carnival Liberty will now call at Grand Cayman on Monday (September 8 - 7am-4pm), Cozumel on Tuesday (September 9 - 10am-6pm), Belize on Wednesday (September 10 - 8am-5pm) and Roatan on Thursday (September 11 - 7am-3pm). The ship will return to Miami as scheduled on Saturday (September 13). Carnival Miracle - departed New York on Saturday (September 6): Substituted a call at Tortola for Grand Turk. The revised itinerary calls at San Juan on Tuesday (September 9 - 3pm-12m), St. Thomas on Wednesday (September 10 - 7am-8pm) and Tortola on Thursday (September 11 - 6am-1pm). Miracle will return to New York as scheduled on Sunday (September 14). Carnival Triumph - departed Miami on Sunday (September 7): Canceled call at Grand Cayman and the day (Thursday) will be spent at sea. The new itinerary called at Cozumel Tuesday (September 9 - 8am-10pm) and Ocho Rios on Friday (September 12 - 8am-330pm). Carnival Triumph will return to Miami as scheduled on Sunday (September 14). Carnival Valor - departed Miami on Sunday (September 7): Canceled its call at Nassau. The revised itinerary will now have sea days Monday and Tuesday, call at St. Thomas on Wednesday (September 10 - 8am-8pm) and St. Maarten on Thursday (September 11 - 7am-6pm). Valor will return to Miami as scheduled on Sunday (September 14). Royal Caribbean's Enchantment of the Seas - departed Ft. Lauderdale Saturday (September 6): The call at Grand Cayman was canceled. The new itinerary calls at Cozumel on Monday (September 8), and the ship will now remain at sea on Tuesday and Wednesday. The ship will return to Ft. Lauderdale on Thursday (September 11). Royal Caribbean's Freedom of the Seas - departed Miami Sunday (September 7): The call at San Juan has been canceled. The revised itinerary will call at St. Thomas on Wednesday (September 10) and St. Maarten on Thursday (September 11). Freedom will return to Miami on Sunday (September 14). Carnival's Holiday - departed Mobile on Monday (September 8): The revised itinerary calls at Progreso on Wednesday (September 10 - 8am-4pm) and Cozumel on Thursday (September 11 - 9am-6pm). Holiday will return to Mobile as scheduled on Saturday (September 13). Royal Caribbean's Liberty of the Seas - departed Miami Saturday (September 6): The ports will be reordered. The new itinerary calls at Cozumel on Monday (September 8), Grand Cayman on Tuesday (September 9), Ocho Rios on Wednesday (September 10) and Labadee on Thursday (September 11). Liberty will return to Miami on Saturday (September 13). Royal Caribbean's Majesty of the Seas - departed Miami Friday (September 5): Canceled its call at Coco Cay on Saturday, and will now call at Nassau on Saturday (September 6) and remain at sea on Sunday (September 7). The ship is scheduled to return to Miami on Monday (September 8). Royal Caribbean's Mariner of the Seas - departed Port Canaveral Sunday (September 7): The call at Ocho Rios has been canceled. The new itinerary calls at Labadee on Tuesday (September 9), Montego Bay on Wednesday (September 10), Grand Cayman on Thursday (September 11) and Cozumel on Friday (September 12). Mariner will return to Port Canaveral on Sunday (September 14). Norwegian Cruise Line's Norwegian Sky - departed Miami Friday (September 5): Canceled its call at Great Stirrup Cay on Sunday (September 7) and will remain at sea. The ship is scheduled to return to Miami on Monday (September 8). Royal Caribbean's Sovereign of the Seas - departs Port Canaveral Monday (September 8): The ports have been reordered. The new itinerary is at sea Tuesday (September 9), calling at Nassau on Wednesday (September 10) and Coco Cay on Thursday (September 11). Sovereign will return to Port Canaveral on Friday (September 12). For links to other weather information, please see the cruise weather page on our main site at cruisenewsdaily.com. This item will be updated as changes are received from the cruise lines. Lowell is no longer considered a tropical system by NOAA so they are no longer issuing tracking statements. Carnival Elation - departed San Diego on Saturday (September 6): Canceled call at Cabo and extends port time at Ensenada. The revised itinerary remains at sea Sunday, Monday and Tuesday and calls at Ensenada on Wednesday (September 10 - 7am-7pm). Elation will return to San Diego as scheduled on Thursday (September 11). Updated September 11: Royal Caribbean's Vision of the Seas departed Los Angeles on Sunday (September 7): Canceled calls at Cabo San Lucas and Mazatlan. On Thursday, the call at Cabo San Lucas was reinstated. The revised itinerary will now spend Monday and Tuesday at sea and call at Puerto Vallarta on Wednesday (September 10) and Cabo San Lucas on Friday (September 12). Vision will then spend Saturday at sea, and return to Los Angeles as scheduled on Sunday (September 14). For links other information, please see the cruise weather page on our main site at cruisenewsdaily.com. Carnival announced this afternoon that the Grand Turk Cruise Center will reopen on October 8, 2008 with the call of Carnival Destiny. All subsequent calls (Carnival and other brands) will operate as scheduled. Carnival reports they still have not completed alternate plans for their ships for the four weeks until Grand Turk reopens. Details were included in the September 11 edition of Cruise News Daily. Additional information was included in the September 8 & 9 editions of Cruise News Daily. Our assessment personnel who have returned from Grand Turk advise that there is no apparent damage to the cruise ship pier. The Grand Turk Cruise Center facility does have some roof damage as well as loss of landscaping. An accurate dollar figure for repairs cannot be determined at this time, pending a closer evaluation of the roof damage. Damage to the island in general is substantial and it appears it is going to take some time for Grand Turk to recover. Based on the relatively limited damage to the cruise center, repairs could be completed fairly quickly. However, the pace of repair work and re-opening of the cruise center is largely dependent on overall recovery efforts on Grand Turk. More information should be available in the coming weeks. For Carnival itineraries that included Grand Turk, the line is working on alternate ports and will advise impacted guests as those modifications are finalized. Initial reports from our assessment team that arrived in Grand Turk this morning indicate that damage to the island is substantial. It appears it is going to take some time for Grand Turk to recover. As a result, we are not able to provide an estimate for re-opening of the Grand Turk cruise facility at this time. Once overall reconstruction on the island gets underway, we can better evaluate the situation. We will pass along any additional details that may become available in the coming days specifically regarding the status of the Grand Turk Cruise Center. Hanna has now moved to New England where she can interfere with calls early in the week in New England and the Canadian Maritimes. At 5am EDT, Hanna was located approximately 350 miles west-southwest of Halifax, and moving northeast at about 36 miles per hour. Tropical storm force winds still extend outward up to 200 miles from the center. NOAA has now discontinued updates on the storm, but cruise lines are continuing to make adjustments to port calls in the Northeast for the early part of the week. Carnival Glory which left Port Canaveral Saturday (August 30) has canceled its call at Nassau on Sunday (August 31) and will remain at sea. The rest of the itinerary will continue as planned calling at St. Thomas on Tuesday (September 2) and St. Maarten on Wednesday (September 3). Carnival Glory will return to Port Canaveral as scheduled on Saturday (September 6). Carnival Legend which left Tampa on Sunday (August 31) will substitute a call at Key West for the one in Grand Cayman. The new itinerary will take the ship to Key West on Monday (September 1), Cozumel on Wednesday (September 3), Belize on Thursday (September 4) and Roatan on Friday (September 5). Carnival Legend will return to Tampa as scheduled on Sunday (September 7). Carnival Miracle, which sailed from New York on Friday (August 29), canceled its calls at San Juan, St. Thomas and Grand Turk. Initially, the itinerary had been modified to call at Port Canaveral (September 1) and then Nassau and Freeport. Due to the strong winds in the Bahamas, on Tuesday (September 2), the Nassau call was canceled. A call has now been scheduled at Newport (RI) on Friday (September 5). Carnival Miracle will return to New York as scheduled on Saturday (September 6). Carnival Sensation, which sailed on Sunday (August 31) from Port Canaveral, is shortening its port call at Nassau on Tuesday (September 2). It will now leave Nassau at 5pm on Tuesday rather than remaining in port overnight (original schedule called for a 6am departure on Wednesday). Carnival Sensation which sailed Thursday (September 4) from Port Canaveral will cancel its call at Nassau. It will now call at Freeport on Saturday (September 6 - 8am-4pm). The ship will return to Port Canaveral on Sunday (September 7) as scheduled. Carnival Triumph which sailed on Sunday (August 31) from Miami canceled its calls at Cozumel, Grand Cayman and Ocho Rios. The revised itinerary announced was that Carnival Triumph would instead operate an eastern Caribbean itinerary calling at St. Thomas on Wednesday (September 3), San Juan on Friday (September 5) and Grand Turk on Saturday (September 6). Then Hanna changed things again. The ship called at St. Thomas on Wednesday (September 3), and now will visit San Juan on Thursday (September 4). The ship will then remain at sea and return to Miami as scheduled on Sunday (September 7). Carnival Victory - departed New York Saturday (September 6): The call at Boston has been canceled, and the day will be spent at sea. The revised itinerary calls at Portland on Monday (September 8), St. John on Tuesday (September 9) and Halifax on Thursday (September 11). Victory will return to New York as scheduled on Saturday (September 13). Royal Caribbean's Grandeur of the Seas - departed Norfolk on Thursday (September 4): The ports have been reordered. The new itinerary calls at Halifax on Sunday (September 7), St. John on Monday (September 8) and Boston on Wednesday (September 10). Grandeur will return to Norfolk on Friday (September 12). Royal Caribbean's Liberty of the Seas which sailed from Miami on Saturday (August 30) is reordering its ports so it will now have an eastward path though the Caribbean. It will call at Labadee on Monday (September 1), San Juan on Tuesday (September 2), and St. Maarten on Wednesday (September 3). The ship will return to Miami on schedule on Saturday (September 6). Royal Caribbean's Majesty of the Seas which sailed Monday (September 1) from Miami canceled its call at Coco Cay and will remain at sea that day. The revised itinerary will call at Nassau on Tuesday (September 2) and Key West on Thursday (September 4). Majesty of the Seas will return to Miami on Friday (September 5) as scheduled. Royal Caribbean's Mariner of the Seas which sailed from Port Canaveral on Sunday (August 31) canceled its port call at Coco Cay and remain at sea. The modified itinerary will then call at St. Thomas on Wednesday (September 3) and St. Maarten on Thursday (September 4). Mariner will return to Port Canaveral as scheduled on Sunday (September 7). Norwegian Cruise Line's Norwegian Sky, which sailed from Miami on Monday (September 1) canceled its calls at Nassau, Freeport and Great Stirrup Cay. Instead, NCL sent the ship to the western Caribbean, calling at Cozumel on Wednesday (September 3) and Key West on Thursday (September 4). Norwegian Sky will return to Miami as scheduled on Friday (September 5). Norwegian Cruise Line's Norwegian Spirit, which sailed from New York on Sunday (August 31) has revised its itinerary canceling the calls at Port Canaveral, Nassau and Great Stirrup Cay. NCL is instead sending the 6-night cruise to Bermuda. With the storm's path, the original destination, at the least, probably would have keep it in bad weather during all of its port calls. Norwegian Spirit will now arrive King's Wharf in Bermuda at 4:30pm on Tuesday (September 2) and remain there until Thursday at 5pm. The ship will arrive back in New York two hours earlier than it would have coming from the Bahamas and is now scheduled to arrive New York at 8am on Saturday (September 6). Royal Caribbean's Sovereign of the Seas, which departed Port Canaveral on Monday (September 1), canceled its call at Coco Cay. The revised itinerary will now call at Nassau on Tuesday (September 2), Key West on Wednesday (September 3) and spend the night there leaving Thursday morning (September 4) spending the day at sea. Sovereign of the Seas will return to Port Canaveral on Friday (September 5) as scheduled. For links to other tropical storm and weather information, please see the cruise weather page on our main site at cruisenewsdaily.com. Carnival Conquest, Sunday, August 24 sailing from Galveston: Canceled its call at Montego Bay and instead called at Grand Cayman (August 27), Cozumel (August 28) and Progreso (August 29). Carnival Conquest, Sunday, August 31 sailing from Galveston: canceled its call at Montego Bay and replaced it with one at Progreso and reordered the ports. The new itinerary called at Progreso (September 2), Cozumel (September 3) and Grand Cayman (September 5). Carnival Ecstasy, August 28 sailing from Galveston: Called at Progreso on August 30) rather than Cozumel. Carnival then kept the ship at sea until September 3 rather than returning to Galveston on September 1. Carnival Ecstasy, September 1, 5-day sailing from Galveston was delayed until September 3 and will operated a 3-day cruise to nowhere, returning to Galveston on September 6. Passengers received a 50% refund of their cruise fare and a 50% discount on a future 3- to 5-day cruise. They also had the option of canceling and receiving a full refund. Carnival Fantasy, which sailed from its temporary homeport of Mobile on August 28, called at Progreso on August 30 rather than Cozumel. Carnival then kept the ship at sea until September 3 rather than returning to Mobile on September 1. Carnival Fantasy September 1, 5-day sailing from Mobile was delayed until September 3 and will operate as a 4-day cruise calling at Cozumel on September 5, and returning to Mobile on September 7. Passengers received a 25% refund of their cruise fare and a 25% discount on a future 3- to 5-day cruise. They also had the option of canceling and receiving a full refund. Carnival Inspiration August 30 sailing from Tampa: Canceled its call at Grand Cayman. Instead it called at Key West (August 31) and Cozumel (September 2). Carnival Liberty August 30 sailing from Miami: Reversed the order of ports, and called at Ocho Rios (September 1), Grand Cayman (September 2) and Cozumel (September 4). Carnival Triumph August 24 sailing from Miami: After calling at Cozumel (August 26), it canceled its calls at Grand Cayman and Ocho Rios. It then called at Half Moon Cay (August 29) and Nassau (August 30). Royal Caribbean's Enchantment of the Seas August 28 sailing from Ft. Lauderdale: The modified itinerary sailed called at Key West (August 29)and Nassau (August 30). Royal Caribbean's Grandeur of the Seas August 21 sailing from Norfolk: Canceled its call at Labadee (August 27) and replaced it with a call at Coco Cay (August 28). Royal Caribbean's Mariner of the Seas August 24 sailing from Port Canaveral: Revised route to become an eastern Caribbean itinerary dropping its calls at Labadee, Grand Cayman and Cozumel. It called at St. Thomas (August 27) and St. Maarten (August 28). For other cruise weather information, please see the cruise weather page on our main site at cruisenewsdaily.com. We had a subscriber contact us this week to tell us that Norwegian Star was in need of some sprucing up. We contacted Norwegian Cruise Line to see what they could tells us, and they know. That's why this week they are in the process of laying new carpet (while the ship is in service) in various parts of the ship. 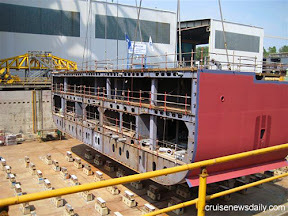 The Norwegian Star is scheduled for a major drydock in November 2009. At this time, however, all the Freestyle 2.0 elements are in place on the ship, except for the action stations in the Lido restaurant, and those will be done during the drydock. Earlier this week in Cruise News Daily, we reported that Princess Cruises had enhanced their Captain's Circle loyalty program for the Platinum and Elite levels. One of the perks of those levels (beginning with the customer's seventh cruise to attain that level) is an internet credit of $75 to $400 per person, depending on the length of the cruise. Until now, that credit has applied only in the internet cafe; it has not applied if you connect to the internet via the ship's Wi-Fi. The program enhancement now allows members to use the credit on Wi-Fi connections as well as in the internet cafe. The announcement said, however, it would be rolled out on a ship-by-ship basis through the end of the year. Our subscribers asked if there was a schedule as to approximate date when the new plan will be offered on each ship. Princess tells us that it is dependent on new software being installed on each vessel. Currently it is installed and operating on all ships except Coral Princess, Golden Princess and Royal Princess. Princess doesn't have an exact schedule for those yet, but the software will be installed on each of them by the end of 2008. When Carnival announced they would be homeporting Carnival Triumph in New Orleans, we've had several subscribers write to tell us they are excited about 7-day Carnival cruises returning to the city beginning in November 2009. But knowing it will then be a ten-year-old ship, they've also wondered about its condition when it gets to New Orleans. We checked with Carnival for any major refurbishment plans before it moves to its new assignment. Carnival tells us that they have been doing some ongoing work as they always do, and one of the most notable additions was the addition of Club O2, the teen club, which was constructed while Carnival Triumph was in service. They did report that Carnival Triumph will go in for its biennial drydock next month. During that two-week time frame, in addition to the mechanical work (which is the main reason for these regular drydocks) they will do some general freshening (deep cleaning, carpet replacement, minor refurbishment, etc), and they will install one of the giant SeaSide Theater screens at the pool area. So late in September, the ship should come out looking fresh and clean, but, of course, who knows what will happen to it over the next year. So to anyone sailing on it in the next year, we're sure the people in New Orleans would appreciate it if you keep your feet off the couches and use a napkin under your glass. Tropical Storm Julio that affected the area of Mexico's Baja peninsula his dissipated. Tropical Storm Fay which was affecting cruise itineraries along the eastern coast of Florida has dissipated and is no longer considered a tropical system. 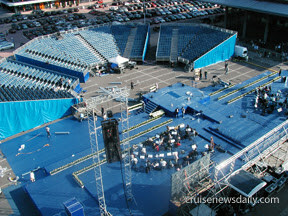 Last Tuesday (July 1, 2008), Queen Beatrix of the Netherlands named Holland America's new Eurodam in Rotterdam harbor. We have uploaded some photos to a Picasa Album. Eurodam made its maiden call at Hamburg today. In celebration tonight, despite the rain which set in about 6pm, the port hosted a fireworks display over the river. While they would have to do a lot to surpass Holland America’s in Rotterdam Tuesday night, it certainly beat keys and plaques. 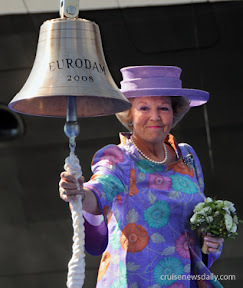 Eurodam was christened today in Rotterdam by Queen Beatrix of the Netherlands. She did her thing and then went to tour the ship and meet some Dutch crew members. Amazingly, there were enough that they circled the entire swimming pool, and she went around and shook every last one’s hand and spoke with each. As I wrote in CND, even at the ceremony it seemed like she wanted to linger a bit longer because she was enjoying the music. It seems a shame that someone in that position, who technically could do anything she wants, in reality can’t. She can’t just say, “Let’s stay for dinner. I hear they are going to have an outstanding fireworks display to mark the occasion tonight.” She has other commitments and there are security concerns and so forth. It’s too bad she couldn’t have stayed. Holland America celebrated the christening of their largest vessel - and the largest ship flying the Dutch flag - with a formal dinner. After dinner at 11:15 tonight, Eurodam’s whistle signaled the start of an incredible fireworks display, one it will take Rotterdam a long time to forget. The fireworks were set off from a barge alongside the ship in the river. At any given time during the display there were at least six shells in the air, and many times, two or three dozen. Near the end of the 20-minute display, a sign constructed of tiny flares that said “HAL 135" (years) was lit on the barge, and that set off a massive launch of maybe 150 shells before a minute-long blast from Eurodam’s baritone whistle signaled to all of Rotterdam’s riverfront that Holland America’s new flagship was ready for service. The ship enters revenue service tomorrow. I worked all afternoon in my stateroom writing CND today. Most of the afternoon I had been aware of some racket outside (we are pierside in Rotterdam), but I didn’t pay any more attention than thinking it was annoying. I have a stateroom all the way forward on Eurodam, near the bow. Since we have arrived, I’ve been seeing them build more or less an amphitheater for Tuesday’s christening on the pier. There has been lots of banging and clanking as they built the stage and seating area. Of course the bow will be where the champagne breaks, so it is center stage. The first part of the afternoon I was aware of music, but since I was involved in my articles I wasn’t really paying much attention. Later in the afternoon, I became aware that the orchestra had set up on the new stage and was playing first the American national anthem and then the Dutch national anthem. They would get to points and stop and start all over again. I’ve probably heard these songs at least 15 or 20 times along with lots of other regal-sounding music. Then again, I have to realize, this may be these people’s only chance to ever play before the queen and they want it to be perfect. The picture above is a view from my balcony of seating area and stage (with orchestra) that they have built since we arrived on Sunday. Eurodam just arrived in Rotterdam where it will be named on Tuesday by Queen Beatrix. Just like for Oosterdam when it was named here a couple of years ago, the Dutch came out by the hundreds to watch it sail down the river and to dock here by Holland America’s original headquarters building. For many, it is a connection back to their family history, because for many generations, people had family members working at sea for the Holland America Line. But the strange thing is how they deal with this. For the most part, they are completely silent. There is no waving. There’s certainly no cheering. They just stand there in silence looking. Occasionally there is a flash from a camera. Some people do shift positions or walk about, but mostly they just stand there. It’s almost like their relatives, long passed, have returned, and by their presence here they are here paying their respects. And by Holland America returning here occasionally now, it seems the line is doing the same. When you pack for a trip, you just don’t exactly realize everything you are going to need until you actually get there and actually need it. You just can’t think of everything. The same is true with a new ship. Literally everything has to be brought aboard in the last month before the ship leaves the shipyard. If there’s something they haven’t thought of, you just don’t have it for awhile. I’m aboard Holland American’s Eurodam today as it is leaving Southampton for the first time. I just got all settled in bed and decided to watch the news on TV before I go to sleep. There’s a nice flat screen TV over in the corner, but I searched the cabin high and low for the remote to turn on the TV. I knew it had to be here somewhere in some cute little place that has been standardized where the stewards should always return them each day. It was probably right out in plain sight, but I couldn’t find it, so I finally gave in and asked. As it turns out, they forgot to load them for all the staterooms on my deck (and who knows how many others). They say we may get them when we get to Rotterdam. In the mean time there are buttons on top of the TV. This must be how they had to do it in Abe Lincoln’s day. In an artist's rendering, Carnival provided a detail of one of the "Scenic Whirlpool" aboard Carnival Dream. In the background along the Promenade Deck, the indoor/outdoor Piazza entertainment area can be seen. Carnival Dream is set to debut in the fall of 2009. The complete article appeared in the June 23, 2008, edition of Cruise News Daily. Earlier this week in Las Vegas, Norwegian Cruise Line president and CEO, Colin Veitch, revealed elements of the nightlife aboard their next generation of ships. Here he briefly describes, Las Vegas style, each of the four clubs and the Ice Bar. The complete story appeared in the June 20, edition of Cruise News Daily. Wednesday evening in Las Vegas, Norwegian Cruise Line revealed the second integral element of their new generation vessel, F3. This event revealed the nightlife. There will be five distinctive nightlife venues, but they aren’t just for the night, rather they will start entertaining passengers in the morning (some at sunrise) and morph from one distinct atmosphere to another throughout the day and the night. Some will be open to everyone, some just to suite passengers, and some will have a charge. Some will feature quite unique entertainment, even to the point of saying it hasn’t been attempted on a cruise ship before. And the venues have been designed specifically to support these concepts. To get you thinking along the right track, remember this reveal about "nightlife" was held in Las Vegas for a reason. Think the unusual production shows with visual effects; think the club scene. The nightlife may not be for everyone, but it is going to be like nothing currently on any other cruise ship. If the "nightlife" isn’t quite for you, there will be plenty of other entertainment, which will be revealed later. Like the new type of staterooms we’ve already seen, NCL, no doubt, has a twist ready to apply to the standard of cruise ship entertainment too. Full details will appear in Cruise News Daily. Last Saturday, on its way back to Miami, Carnival Valor spotted a raft with migrants aboard and carefully pulled close to investigate. They found six men and a woman on the raft, and in line with regular procedures, they advised the US Coast Guard, which said they would send a ship to pick up the people. Carnival Valor remained with the raft until the Coast Guard arrived to make sure the people would be safe. While they were waiting, they supplied the people with fresh water since they had been without for five days. But not all the communication was with the Carnival crew. The passengers usually want to know why the ship has stopped and quickly understand the situation. Even though it's a routine (and regular) occurrence for cruise ships, for the passengers, it's quite unusual. In this case, according to local Miami media, the passengers were shouting back and forth to the migrants and even taking pictures. At one point, one of the men on the raft shouted a Miami phone number to some women on a balcony and asked them to call his relatives and let them know that he was alive. The Coast Guard eventually did come and take the people aboard their ship, and Carnival Valor continued on its way back to Miami. Under US policies, since the people did not actually land on shore, it's doubtful they will be allowed to remain in the US. These happy people are transferring ownership of Eurodam from Fincantieri to Carnival Corp.
Stein Kruse (at right), the president of the Holland America brand, is signing the document accepting delivery. 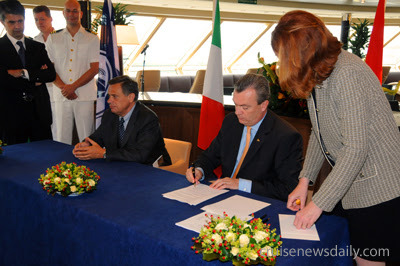 The formalities took place today aboard the ship at Fincantieri's Marghera yard. The ship is the first in the new Signature-class and the 14th in the Holland America fleet. 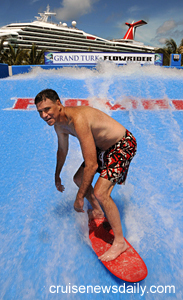 Carnival's own FlowRider surfing simulator entered service today at the Grand Turk Cruise Center. 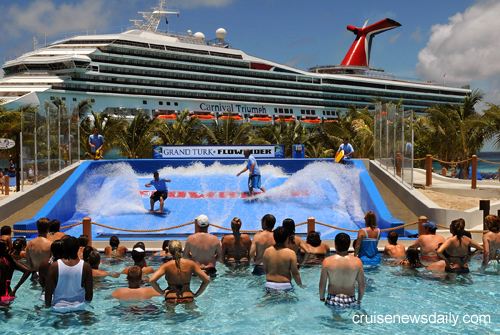 Catching one of the first waves was Carnival Cruise Lines' president, Gerry Cahill. The attraction is located adjacent to Margaritaville just at the end of the center's pier. It is available as a shore excursion on all ships stopping at Grand Turk. EasyCruise Life grounded briefly today while entering the harbor at the Greek port of Syros. There were no injuries. The ship was towed to port, and the cruise will continue as scheduled. Wireless Maritime Services reports that Royal Caribbean has renewed their contract for five years to provide cellular telephone service to passengers and crew members on the company's Royal Caribbean and Celebrity brands. The WMS agreement covers the existing ships in those brands as well as any new ships added during the life of the contract. 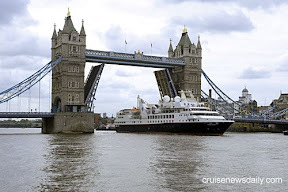 Silversea's Prince Albert II arrived in London this morning sailing under the Tower Bridge. The ship embarks its first passengers on June 12. The complete article appeared in Cruise News Daily on June 11, 2008. 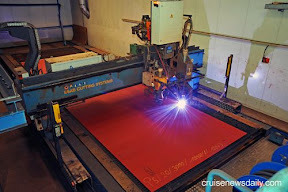 The first steel was cut today at Meyer Werft in Papenburg for Celebrity Eclipse. Celebrity Eclipse will be the third in the 122,000-ton Solstice class and is scheduled for delivery in June 2010. The first, Celebrity Solstice, will be floated out in August, and delivered in October. The complete article appeared in the July 11, 2008, edition of Cruise News Daily. Oceania has decided to drop the 3-day call at Yangon, Myanmar, on Insignia's 16-night cruise from Dubai to Singapore. Much of Myanmar has been devastated by Cyclone Nargis last month. The itinerary has been adjusted by adding a day here and there so the ship will still depart Dubai on December 4 and arrive Singapore on December 20. On the bright side, the revision now makes a 3-day excursion to the Taj Mahal possible. The down side is the excursion costs $1899.